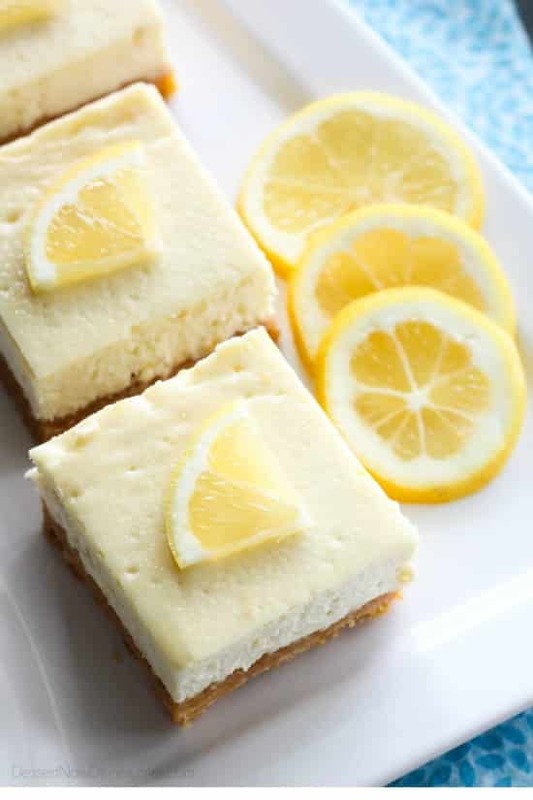 Lemon Cheesecake Bars - Dessert Now, Dinner Later! 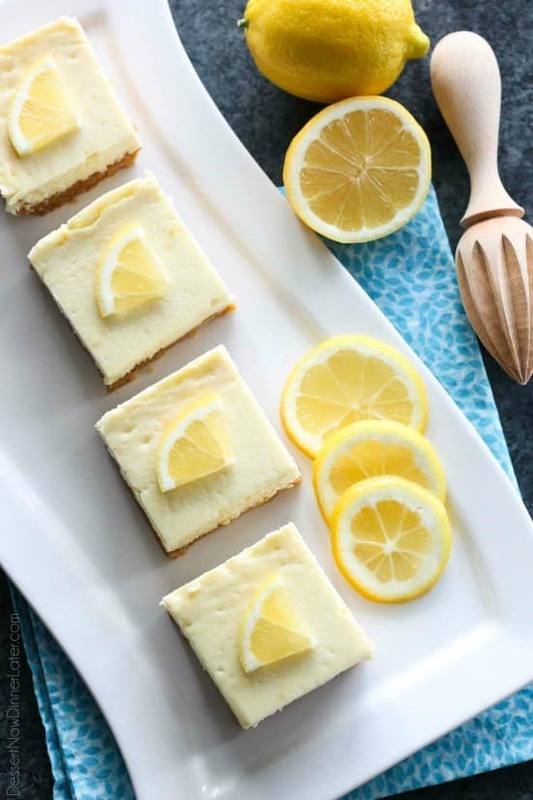 Lemon Cheesecake Bars are creamy and lightly sweet with a bright and tangy lemon flavor throughout for a wonderful spring time dessert. 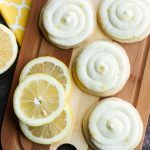 Surely you aren’t sick of my lemon recipes yet, right?! 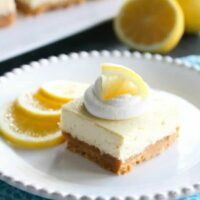 I hope not, because today’s recipe for Lemon Cheesecake Bars is so good, and FULL of lemon in both the crust and the cheesecake filling! 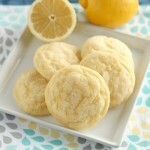 Honestly, I was slightly worried that when I created this recipe, it would have too much lemon. 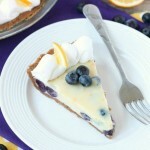 I used Lemon Oreos for the crust, and fresh lemon juice, lemon zest, and lemon Greek yogurt in the cheesecake filling. 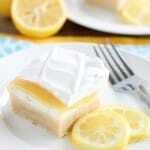 Personally, I love a lot of lemon, but my husband thinks there is such a thing as too much lemon in a lemon dessert. 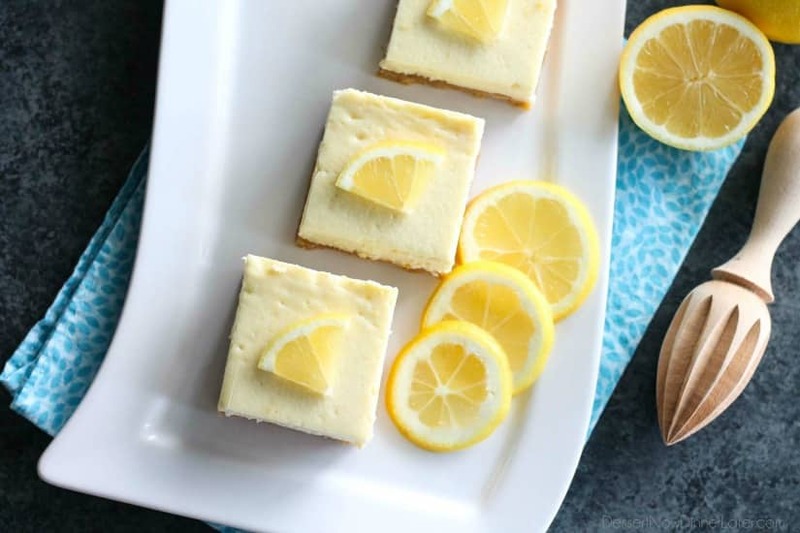 Luckily, after these Lemon Cheesecake Bars were baked, those flavors mellowed out to the perfect hint of tangy lemon pleasure. Even my husband approved! 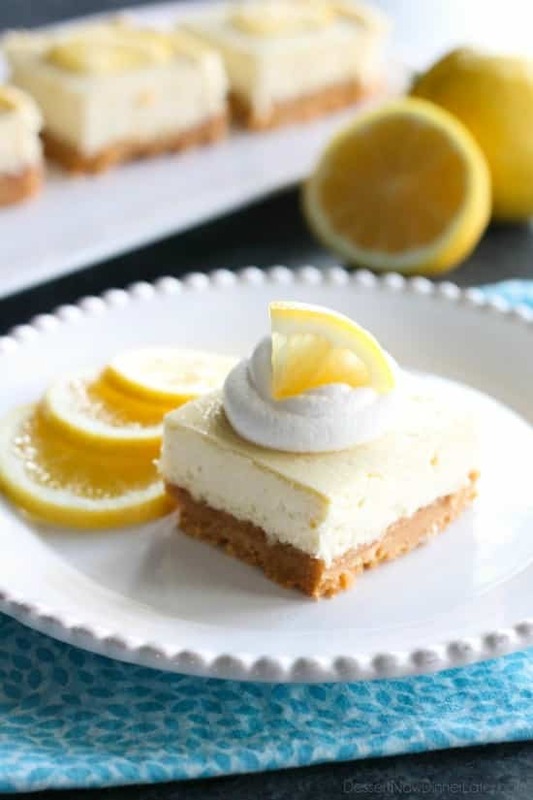 The Greek yogurt adds a nice tang and extra creaminess to the cheesecake filling. 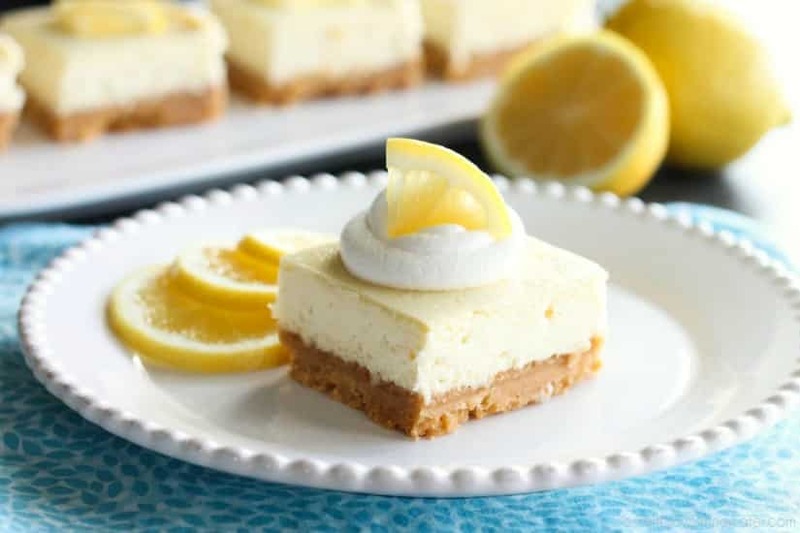 The aroma and flavor of lemon is wonderfully apparent throughout each bite of these Lemon Cheesecake Bars. Cheesecake Bars are certainly less intimidating than a full sized cheesecake baked in a springform pan, so even if you’re not an avid baker, I hope you try this simple and delicious spring time dessert! 20 Lemon Oreos Use Golden Oreos, if you can’t find Lemon. Place Lemon Oreos into the bowl of a food processor and blend until fine crumbs are formed. Add crumbs to the prepared baking dish. Pour melted butter over the top. Mix with hands until all crumbs are wet. Press evenly onto the bottom of the pan. Bake for 12 minutes, or until lightly brown and matte (not shiny). Cool slightly, about 15 minutes. In the bowl of a stand mixer fitted with the paddle attachment, beat together the cream cheese, Greek yogurt, and granulated sugar until smooth. Scrape bowl. Add the eggs, egg yolk, lemon zest, and lemon juice. Mix thoroughly. Pour the cream cheese mixture over the crust. Return to oven and bake an additional 28 minutes, or until the cheesecake appears set on top and only jiggles slightly when you wiggle the pan. Turn oven off and crack oven door part way open. Keep cheesecake inside oven for 1 hour. Then cover and chill the cheesecake in the refrigerator for 4 to 8 hours (overnight works best). Cut bars and serve topped with whipped cream, if desired.